Kim Ina, Emery Clay III, Stephen Holsapple, Satsuki Ina. Dr. Ina is Professor Emeritus in the School of Education at California State University, Sacramento and founder of the Family Study Center. She was born in the Tule Lake Segregation Center during her parents' four-year imprisonment in the WW II American Concentration Camps. As a licensed psychotherapist specializing in cross-cultural counseling, she has conducted groups for Japanese Americans who, like herself, were children in the prison camps. She has been researching the long-term impact of the internment for the past fifteen years and her work culminated in the production of the Children of the Camps documentary, which was nominated for a Northern California Emmy and was broadcast nationally on PBS from 1999 to 2003. 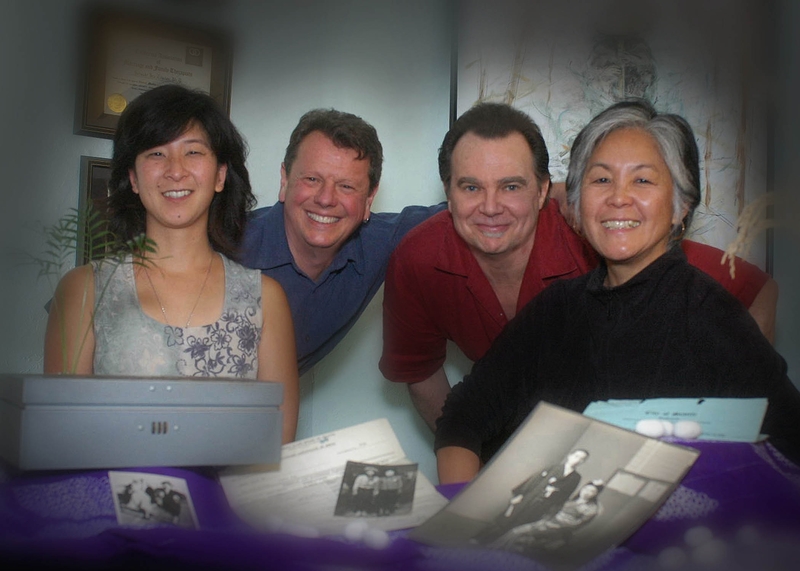 With funding from The California Endowment, Dr. Ina utilized the Children of the Camps documentary as a community intervention program, and conducted 110 screenings in various Japanese American communities in the US and in Japan. In 2004, she served as consultant and assistant curator for an exhibit titled, Snow Country Prison: Interned in North Dakota, which was based on her father's wartime haiku poetry and other historical documents she has collected. Mr. Holsapple is a Northern California Emmy-award winning filmmaker, artist and musician whose career in these related fields has spanned over 25 years. He has worked extensively in the Sacramento area since the early 80s, working independently as a director, producer, editor and actor. His award-winning credits include Big City Gambler, winner of 6 Northern California Regional Emmys, Sorghum, winner of a Houston International Film Festival Gold Award, and La Scala di Vito (a Leon Corcos Film), winner of best comedy short at both the Chicago and Atlanta Film Festivals. He also won a Telly Award for his montage opening of ENVISION 18 (1993), one of the world's largest graphic conferences. Over the last ten years he has directed, filmed and/or edited numerous projects for international clients like Magnavox, Olympus, Intel. Ms. Ina has worked as a freelance producer/photographer/editor in the educational video industry for the past 8 years. She has been involved in the production, dissemination, and outreach of several documentary and print projects. These include the Children of the Camps Documentary and Educational Project (nominated for a Northern California Emmy), Conscience and the Constitution (for ITVS), the Color of Fear (Gold Apple Award, National Educational Media Network), From Our Side of the Fence, and Generations: A Japanese American Community Portrait. She has also produced several in-house training videos while working at Stir Fry Productions for Lee Mun Wah (producer of the Color of Fear and the Color of Fear II), and several music videos for the Sports for the World's Children Foundation (of which she is Founder and Executive Director), a nonprofit in San Francisco that distributes used and new sports equipment and school supplies to communities and schools with limited resources, and Upward Bound in Napa, California, a summer program for teens striving to be the first in their families to go to college. Mr. Meggs has been an independent music composer and producer since 1986. Over the last 18 years he has scored 5,000 broadcast TV commercials and 50 documentary soundtracks. He is currently composing for a number of TV shows airing on the Discovery and A & E Channels. Mr. Koga is Director of the Japanese Music Institute of America. He heads the muscial group "Essence," which was selected for the 2000-2006 Touring Artists Directory by the California Arts Council.